Impress your customers with the style and comfort that are synonymous with Volkswagen build quality. Wheelchair access in Vista™ is achieved without the need to fold away the standard middle row seating. Spacious and stylish, Vista™ makes the perfect choice for any business or organisation looking to add a touch of class to its fleet. 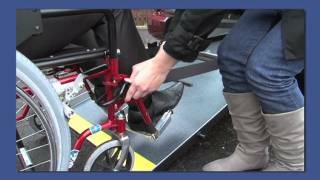 This popular vehicle provides unsurpassed ease of access for wheelchair passengers with the EasyFold™ wheelchair ramp which is light and easy to use. Vista™ also includes a wealth of wheelchair accessible features including a non-slip, lowered floor, designed for optimum access, and high quality, adjustable wheelchair restraints. Vista™ comes with completely original Volkwagen seating and can accommodate driver, wheelchair passenger and up to four seated passengers. The ramp folds flat to the vehicle floor when not in use as a wheelchair accessible vehicle to create loads of boot space. Vista’s™ superb 102 PS TDi diesel engine delivers brilliant performance combined with excellent fuel economy of up to 48.7mpg and low emissions, and comes in the choice of manual or automatic transmission. Volkswagen Vista™ mobility cars can accommodate driver, wheelchair passenger and up to four seated passengers. There is ample room in the Vista™ wheelchair car for someone to travel in their wheelchair or store their mobility scooter, before using one of the standard seats. Unlike many other wheelchair accessible vehicles, Vista™ retains Volkswagen’s original seating giving the vehicle a superior finish. Take a look at the Volkswagen Vista from Allied Fleet combining a taste of luxury with excellent accessibility.